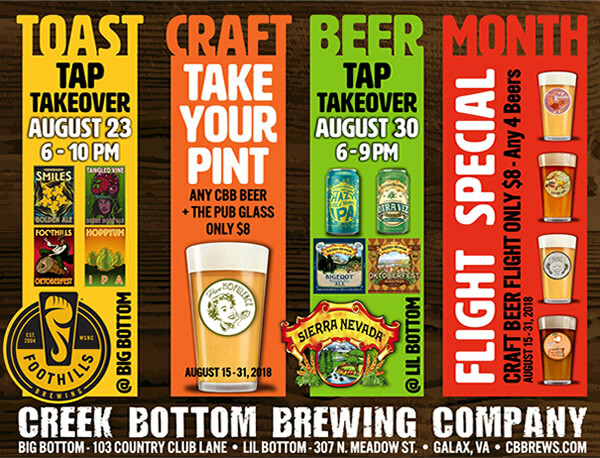 Since August is Virginia’s Craft Beer Month, we decided to celebrate with some killer beer and CBB specials for our customers at Big & Lil Bottom. NEW PURE HOPULENCE PINT GLASSES ARE IN!!!!! Fill it with a local CBB Brew, AND take it home with you for just $8. August IS the 8th month, so we decided to throw another $8 special at ya with ANY full flight! That’s right, get 4, 5oz flight glasses filled with ANYTHING we have on tap for just $8!!! We also have NEW T-shirts in stock, and growlers to come! Happy Virginia Craft Beer Month everyone!! !